Tenryuji is just a short walk from the Keifuku Arashiyama Station. If you're travelling directly from Kyoto Station though the best way to access the temple is from JR Saga-Arashiyama Station. From JR Saga-Arashiyama Station it's only a 5-10 minute walk to the temple. The ride from Kyoto station is about 20 minutes long and costs 240 yen. There are two options for ticketing when you come in. You can pay 500 yen ($5 USD) to enter the grounds or pay an extra 300 yen ($3 USD) which will allow you to also enter the interior of the building. The price difference is pretty minimal and for anyone interested in Japanese architecture and Buddhism, purchasing the interior ticket is worth the extra cash. The temple is open from 8:30am to 5:30pm or until 5:00pm during October to March. There are no closing days. 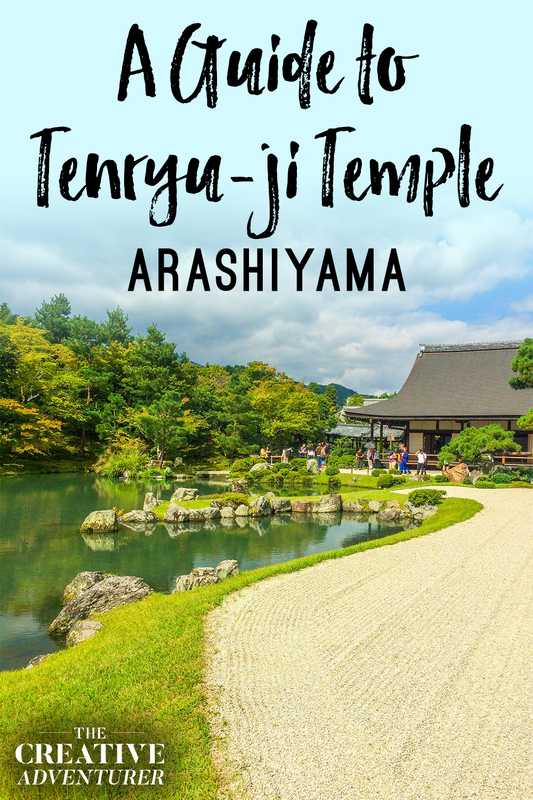 The Tenryuji temple was first built in 1339 by the ruling Shogun Ashikaga Takauji. Takauji had quarreled against Emperor Go-Daigo over supremacy of Japan. When the emperor died, Takauji didn't have the chance to mend the tensions between the two powerful men. This open-ended disagreement didn't sit well with Takauji, and so he decided to build the temple in honour of the emperor in the hope to appease the emperor's spirit. We walked up the hill and from the top had a breathtaking view. We stopped on the bench at the top and got out our lunch snacks. We put away out phones and, just for a few minutes, quietly enjoyed the peace and tranquility around us. Most people would run up, take a picture and run back down. We were so happy to find ourselves in a moment of the day when we weren't in a rush and could just take the day as it came. We watched the clouds roll in and out and looked at the sun as it disappeared behind the clouds. We listened to the gentle rattle of the bamboo grove behind us and the sound of running water trickling from the fountains below. Across the pond, you can see Dragon Gate Falls. This is made up of several large stones, symbolizing carps swimming upstream. It is an allegory of an old Chinese myth. It goes that "if a carp can swim up a waterfall, it will be turned into a great dragon." The story in the centre of the pond symbolizing the carps transformations that come only with enlightenment and encourages all those come here to visit or to study to find the same thing. The temple is now the headquarter of the Rinzai School of Zen Buddhism. In the Rinzai Zen school, there is great emphasis put on "seeing one's true nature". While walking up and down the pathways, I tried my best to get in touch with my true nature, my inner self. Although I didn't come to any huge realizations, I did feel deep down a massive sense of accomplishment in being here. When I was sick never thought I would get better. When I was alone and I never thought I would be in love again. And yet here I was, alongside my husband, feeling great and explore a country I never would have seen were it not for him. The Hojo is the largest structure in the compound, which is made up of two separate buildings; the Daihojo and the Kohojo. The Daihojo is used only for ceremonies and other large events. Its iconic veranda surrounds the entire structure, providing a seamless combination of indoor and outdoor space for those inside. The floors inside are covered with traditional tatami mats, and rooms are separated by using sliding bamboo doors. Inside this building, we can also find the famous painting by Wakasa Butsugai of the iconic Cloud Dragon.